So I have now completed (minus 2 days) an entire calendar year of reading and reviewing books on my blog – and what a year it has been! Before I choose my top 10 books for the year I thought I’d share some facts and figures with you because that’s how I roll. In 2014 I have read 140 books and it will be no surprise to regular readers that the composition of genre is crime heavy… but I did manage an impressive 33 books that fell into (my) contemporary fiction category as well as 17 books with a historical theme. I should warn everyone that I play fast and loose with genres and anything I’m not sure where to put does end up as contemporary fiction, but it is a guideline (of sorts). Out of my crime reads the split was also unsurprisingly heavily weighted on the psychological fiction slant with 37 books falling into this genre, 33 logged as crime thriller and 11 in the mystery category. When I started blogging I was curious to see how much of my reading could be supported by review copies of books, this wasn’t a new concept as I’d been part of Amazon Vine since 2011, but I’d not counted for the ease of requesting items from NetGalley, the quantity of kind publishers and authors that offer me books, Lovereading who send me copies as part of their reviewing panel or Bookbridgr who have physical copies they are happy to post to me. That along with a little bit of stalking of my favourite authors on Twitter has kept me in more than enough books for the whole year! In 2014 only 25 books, less than 18% of the books I read, I owned (and I’d won copies of 3 of these). Now I’m not making any promises too stop reviewing ARCs, I love finding new authors, catching up with old ones and sometimes reading something a little bit different to the norm, far too much for that, but I am going to redress the balance a little and aim for 60:40 split. Well, lets see how that goes shall we? Why? Well out of the books I’ve read this year 63 were by authors whose books I’d previously read. This is a whopping 45%! This means that exponentially, even discarding the minority whose books weren’t for me, or who don’t write a new book in 2015, of the new to me authors should even 40 produce new books these added to the known to me author output, can only be disastrous for the TBR ??? That doesn’t even take into account any back catalogues! This is why cutting down on books is never going to happen!! But what a fantastic problem to have! So which of my reviews have been most popular in 2014? 10. The magnificent debut and psychological thriller by Mary Kubica – The Good Girl This book with four narrators has no chapter breaks which meant I was compelled to keep reading to find out why and how Mia Dennett disappeared. 9. A Crime Fiction novel Daughter by Jane Shemilt is fixed around the disappearance of Jenny’s 15 year old daughter, Naomi but also uncovers a web of secrets and lies. 8. Sarah Hilary’s police procedural, Someone Else’s Skin blew me away with it’s range of characters and skilful handling of a storyline about domestic abuse was a fantastic find in February 2014. 7. In The Last Winter of Dani Lancing by P.D. Viner we meet Jim and Patti Lancing who react in very different ways to the murder of their daughter mixed with an accomplished whodunit. 6. Sees a psychological domestic thriller with Lucie Whitehouse’s Before We Met which tells the tale of how Hannah found out more about the man she married. 5. A Dark Remembered Day by Tom Vowler was put in the psychological suspense category because the author literally reveals the progressive layers of the protagonist’s mind as the tale unfolds. This was an unequivocal 5 star read. 4. Wake by Anna Hope has stayed in my mind ever since I read it nearly a year ago. This tale of the run up to the Internment of the Unknown Soldier was beyond poignant. The best book about WWI that I have read although Andrew Cowan’s Worthless Men comes a close second. 3. Having missed the TV series Broadchurch , I jumped at the chance to read the book of the series especially as it was written by one of my favourite authors, Erin Kelly. I loved the story so much I had to watch the TV series to compare and will now be glued to the second series next Monday. 2. In February I read a book about a fictional stalker, The Book of You by Claire Kendal brilliantly portrays the mind of a stalker and captures the powerlessness of his victim, not only that but the storyline has a parallel to an ongoing court case. 1. The most popular review of the year goes to an author whose books I’ve been championing for a while but this one surpassed all my expectations. Sleep Tight by Rachel Abbott is a brilliant psychological thriller, even better I believe you can get a copy for a mere 99p at the moment. So those are the reviews you’ve enjoyed – coming soon my favourite books that were published in 2014. I’d like to thank all those authors and publishers who’ve given me a fantastic selection of books, the readers and commenters on this little blog and those who connect with my reviews via twitter, you have all made my world brighter in 2014. Happy reading everyone and here’s to Happy a New Year full of new books! What a fantastic summing-up, Cleo! You’ve had a good reading year, and I’m glad for you. I also really respect that ‘numbers’ approach you took to sharing your reading year. I’ll be keen to see how your reading progresses in 2015. I do love data Margot and having kept such a careful log this year I wanted to share it with my readers…. It is lovely to review my year’s reading like this and remember some of the great books I’ve had to read. I’m happy you had such a good blogging year, and I still have several books on this list to read! Best wishes in the new year. Thank you – Happy New Year to you too! Thank you Karen – my personal Top 10 will follow but there is probably some crossover. Happy New Year! I love the way you summed it all up, and you made me want to read all the books on your list that I haven’t yet devoured. I do have Before We Met lying patiently on Sparky…and I now MUST have Sleep Tight, along with Daughter and Someone Else’s Skin. I will have my eyes peeled for these! Thanks for sharing. Thank you Laurel. Sleep Tight is a must read especially as it is written by an author who inhabits one of the Channel Islands – a rare breed indeed! Happy New Year! Marie, that is fantastic news – always pleased when someone ‘new’ finds me – you’ve chosen three great reads from today’s selection. I so wish I hadn’t read this post Cleo! My want to read pile has just grown considerably. I’ve loved reading your blog this year and look forward to sharing some more good reads with you next year – here’s to a happy and healthy 2015. Ah thank you Dawn – it’s people like you who make me smile. 🙂 Happy New Year to you too. Enjoyed hearing about all your reads of 2014. I hope to do the same, but I have to get three more reviews in by end of year! I’ve read the books, just not reviewed. Holiday greetings to you, Cleo. May you continue your great analysis of your reads in even greater frequency in 2015! I’ve cheated a little too as I have two reviews still to write but hey it’s the holiday season! Thank you for your kind words and Happy New Year! Thank you Raven, it’s always good to share the best of the very good bunch! Thank you – I do have two reviews to write but I doubt I’ll get another book finished before the end of the year and I like ending on a good number 😉 I love seeing the popular reviews and I did enjoy all of the books that made this list but some of my favourites are missing! Fantastic list!!! You’ve had a good reading. And I have stopped asking for arcs entirely. You had a great year in books. I also loved The Book of You. I thought it was such a realistic look at how stalkers operate and how isolated a victim can feel – the advice from the leaflets etc. was quite an eye-opener. Wow – 140 books is a crazy high number! That’s amazing! And – I like to see my TBR list shrink because it feels like progress, but of course it NEVER does now that I blog! C’est la vie! Happy new year Cleo ! 🙂 And 140 books is amazing ! I’m completely awe-struck right now. Hope to get more crime novels from you for my tbr next year ! I’m excited to see what books topped YOUR personal list, thought it’s interesting to see what reviews were popular with readers. 🙂 You’re always showing off books I want to read! My personal list is scheduled for tomorrow – tough choices have been made! Thank you for your kind words and all the very best in 2015. Congratulations on a great year! Wishing you all the best in 2015. Thank you Lisa – Happy New Year to you too! I’ve got MOST of these – some, I’ve shockingly still to read, and I’ll get to them VERY SOON. But I didn’t have the No.1, which I subsequently bought (for 99p – and that was before the New Year book buying ban enforcement of the TBR Double Dog Dare, before anyone says anything!) 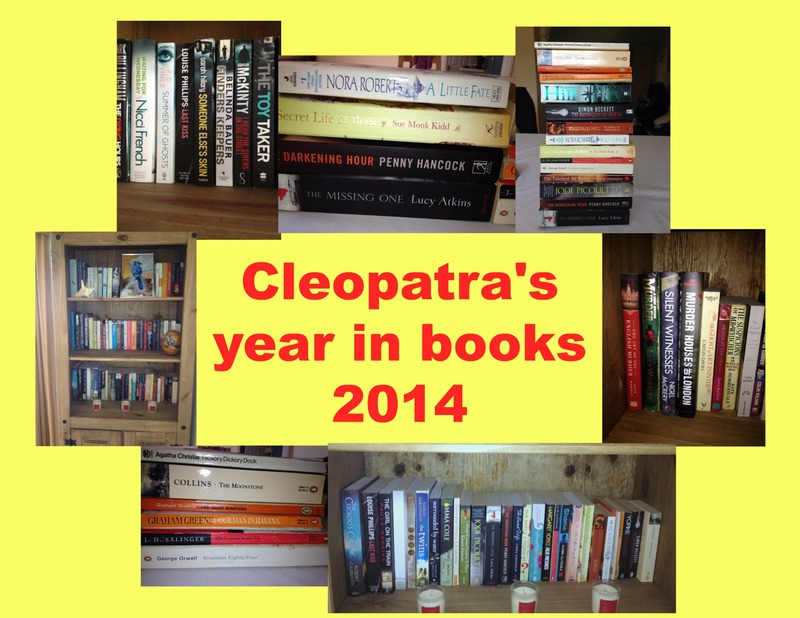 A great list Cleo – as I’d expect – and 140 books? Wow! So glad you got Sleep Tight – I’ve read all Rachel Abbott’s books and the next one is out soon!! I had to get it, especially when it’s made your no. 1! I’d seen it about, but I thought it was a kind of cheap-and-crappy book, as I hadn’t seen any reviews for it. I can’t believe she’s passed me by, but it’s great to find a brand spanking new author – and if you think she’s great, there’s a v good chance we’ll agree!! She must be excellent, to make no. 1 in such esteemed company. Thank you! I read this author’s first two books before I realised that she lived in Alderney but unfortunately she didn’t make it across to Jersey for a book signing… I hope you enjoy it, she was the most read review of the entire year, currently at 453 views!! No doubt her being number 1 encouraged people to check the review out – she’s probably noticed a bump in her sales after this chart, especially when it’s that price! In fact I must go and read the review – find out a bit more about it!